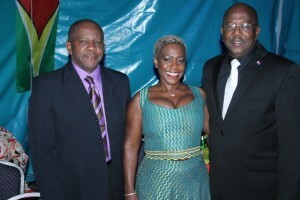 Director-General of Tourism, Donald Sinclair (left), St. Maarten’s Prime Minister, William Marlin (right) and Mrs. Marlin. Guyana and Dutch St. Maarten are exploring ways of establishing trade, mega farming, and tourism between the two countries, according to top officials. He proposed the establishment of a Guyana Tourism and Investment Association of St. Maarten to forge ahead with developing “an extremely important relationship” in the areas of tourism and culture. He invited Guyanese residing there to travel to their homeland to attend the first Coconut Festival that will promote the use of the coconut in all its forms. Sinclair also held talks with senior representatives of the Guyana- St. Maarten Association to explore ways of cooperation in tourism, sport, cultural and business exchanges. He also floated the idea of a periodic publication on Guyana- St. Maarten affairs. There are more than 8,000 Guyanese living and working in that Caribbean country which is part of the Kingdom of the Netherlands. St. Maarten’s Prime Minister, William Marlin said if he is re-elected at general elections due in September, 2016 he would lead a delegation to Guyana to explore the possibility of farming agricultural produce specifically for St. Maarten “big” market of tourists and residents. “We were looking at the possibility of leasing the land in Guyana and getting farmers in Guyana to cultivate that land, but for the sole purpose of the produce being sent to St. Maarten or for the St. Maarten,” he said. Marlin said even if the St. Maarten government could encourage farmers to go that country, there is a paucity of arable land and insufficient water. The St. Maarten Prime Minister lamented the virtual absence of cooperation among Caribbean countries and the absence of timely regional transportation as major humbugs facing agricultural production and supply. Trinidad and Tobago investors had been up to last year been examining ways of engaging in large scale agricultural production in Guyana. A Barbados company is already doing so in southern Guyana.